4 Washington County officials swore into office on the second floor of the Washington County Courthouse Wednesday morning. Among the 4 Washington County officials was newly appointed sheriff Scott Owen. Sheriff Rick Silver retired as of December 31st and Scott Owen took over the position with the new year. When Owen swore into office today, he thanked all his family in attendance and others. He was especially grateful for the Washington County Commissioners who put their faith in him to take over as sheriff. 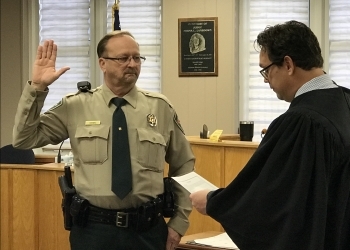 The Washington County Commissioners chose Owen from a field of six candidates earlier this fall to succeed former sheriff Silver upon his retirement. Owen will complete Silver’s term of office and will be up for election in 2020. Re-elected District 1 Commissioner Mitch Antle, District 3 Commissioner Mike Dunlap and County Assessor Todd Mathes also swore-in to their offices Wednesday morning.